Hurricane Harvey's remnants left much of Houston underwater on Sunday, and the National Weather Service says it's not over yet: Some parts of Houston and its suburbs could end up with as much as another 1.3 metres of rain. 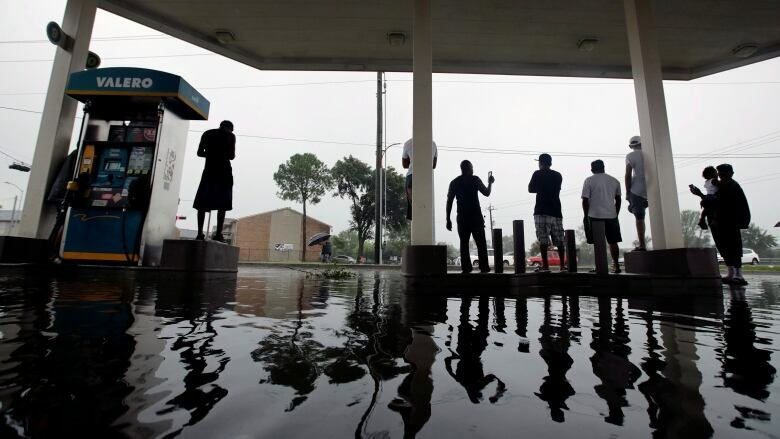 The storm has affected about 2.2 million barrels per day of refining capacity in the United States, including ExxonMobil, Shell and Phillips 66 operations that began shutting down Sunday. "They are not making gasoline, they're not making diesel fuel," said Randy Ollenberger, managing director of BMO Capital Markets, "so that's tightening up those markets not only here in North America, but globally because the United States was exporting both gas and diesel to Europe and South America." And Canada too, which is why gasoline prices that have jumped about seven cents a litre in a week may come north next. Depending on how long refining capacity is out for, the impact on Canada could be even worse, says Dan McTeague, senior petroleum analyst with price comparing website GasBuddy.com. "Hurricane Harvey's associated flooding and longer than expected stall over the Texas refinery row is likely to see steep price hikes at the pumps across North America for the next few weeks," McTeague said. "With a portion of total U.S. gasoline production shut in due to the prolonged effects of Hurricane Harvey, Canadians should expect a noticeable increase beginning this Wednesday." Toronto and most of Ontario are in store for a five-cent hike, while Montreal may see the biggest jump — as much as a 15-cent increase to about 127.9 cents a litre by mid-week. "For the Maritimes and Newfoundland, which follow last week's prices under their regulated price regimes, a five cent a litre increase should be expected with the possibility that their 'interrupter clause' may be deployed before Thursday and Friday," McTeague said Monday. Beyond pump prices, the storm has the potential to take a bite out of the North American economy, if the heavy hit to the energy sector spreads — and lasts. "I'm not sure if we can really quantify how much that will be right now," Ollenberger said. "It really depends on the duration, but it will have an impact. "The longer this goes on — in terms of these outages — the bigger the impact will be."